Charlie Morton's Great Stuff was pounded yet again in an embarrassing 8-2 Pirate loss to Cincinnati last night, in which the struggling pitcher with a supposedly high upside yielded eight hits, three walks and seven runs in two innings of work. After last night's start, Morton's record fell to 1-9 with a 9.35 ERA, with a .342 opponents' batting average and 12 home runs allowed. When he doesn't pitch, the Pirates are 19-18. "We talked," Russell said of his meeting with Morton. "He's worked really hard and, unfortunately, tonight was a night where nothing really paid off for him. We'll re-evaluate it and see where we are. It was a step back, and we've got to see what we can do to go forward again." Will Morton stay in the rotation? Could he ever go to the bullpen? "No. He's going to be a starter, no matter what." Try not to hurt your head from banging it against the wall - if you still care, that is. On the other side of the ball, the Pirate offense continued to stink, but hey, Aki Iwamura got his first RBI in a month! Other than that development, Jeff Clement had three hits, and Ronny Cedeno had two doubles. The 3-4-5 hitters combined to go 1-for-10, and Neil Walker cooled off considerably with an 0-for-5, 4 left-on-base performance. It was your typical, bland output from the Bucs' bats. 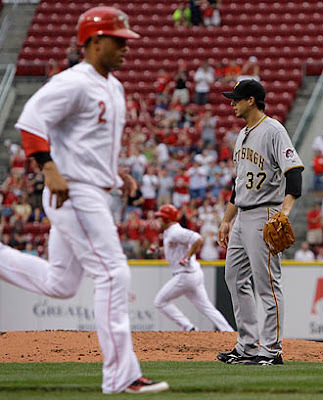 As Joe Starkey proclaimed yesterday, the Pirates trotted out one of their worst lineups of all time on Thursday: Cedeno, Walker, McCutchen, Jones, Church, LaRoche, Clement, Jaramillo, and Morton. Considering that one of those players is hitting above .260, it's hard to argue with that viewpoint. A new series for the Bucs starts up tonight, as Zach Duke (3-4, 4.47) faces Derek Lowe (6-4, 5.30) and the Atlanta Braves at Turner Field, with gametime set for 7:35. Why isn't Bob Walk our pitching coach? I would LOVE to hear what Walkie has to say off the record about Morton. I hope Walk never leaves the booth. Last night, the game was out of hand (of course) and he had Neverett teaching him Japanese. I just hope that Russell never comes to his senses. If that's the case a 20 loss season is all but assured...but why stop there, shoot for the stars Chuck, 30 is within your reach...go for it! I thought Morton was "coming around"? Morton is a lock as the Pirates lone representative for the All-Star game. They need someone with his great stuff to pitch the Home Run Derby. Yeah, he was a great acquisition. "Great stuff", of course, is a relative term. Depends on which side of the ball your on.